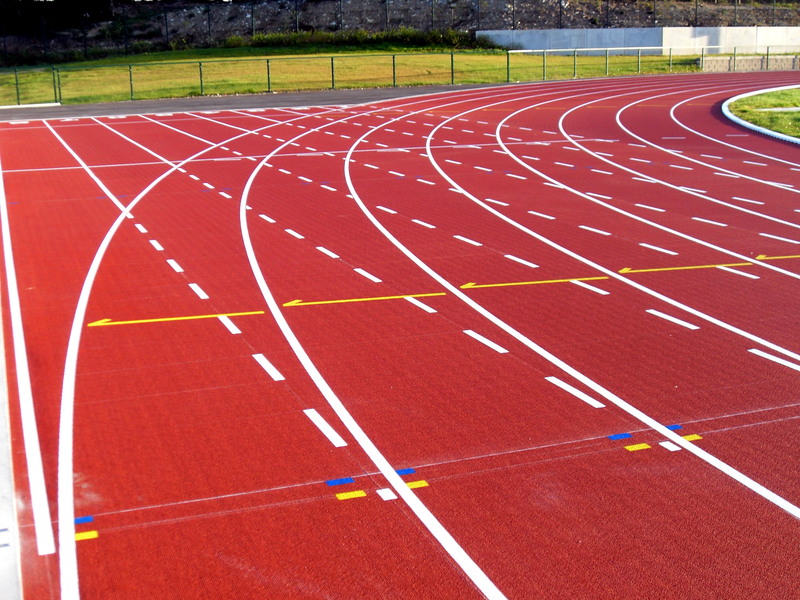 A number of organisations across the UK such as schools, clubs and leisure centres are choosing to install polymeric rubber surfacing for sports courts and athletics facilities. This flooring is ideal for activities like netball, basketball and tennis due to its excellent ball bounce qualities. We can provide a number of polymeric services for these projects including full construction, maintenance, repainting and reline marking. Our team can customise everything to suit your budget and make sure that the work is affordable for you. You can speak with our team today to find out more about all of these products and the services we provide. Just fill in the contact form and we’ll reply back with some advice on prices and specifications. Let us know if you’ve got any requirements about budget or playing qualities and we’ll take this into account when working out the costs. What is Polymeric Sports Flooring? Polymeric sports flooring is a surfacee which is made up of EPDM rubber and can come in a range of designs. 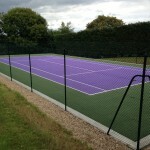 It is ideal for creating a hard court which is suitable for playing tennis, basketball, netball and other activities. Rubber EPDM surfacing is a popular specification option as it provides ideal ball bounce and slip resistance qualities. The polymeric surfacing is also porous so it’s SUDS compliant to allow good water drainage, preventing puddles from building up in wet weather. It is common for schools and leisure centres to have this kind of flooring installed as it is durable and strong enough for regular use. If you are looking to create a multi purpose facility, this is also a good option as it’s versatile enough for many sports and activities to be played on it. 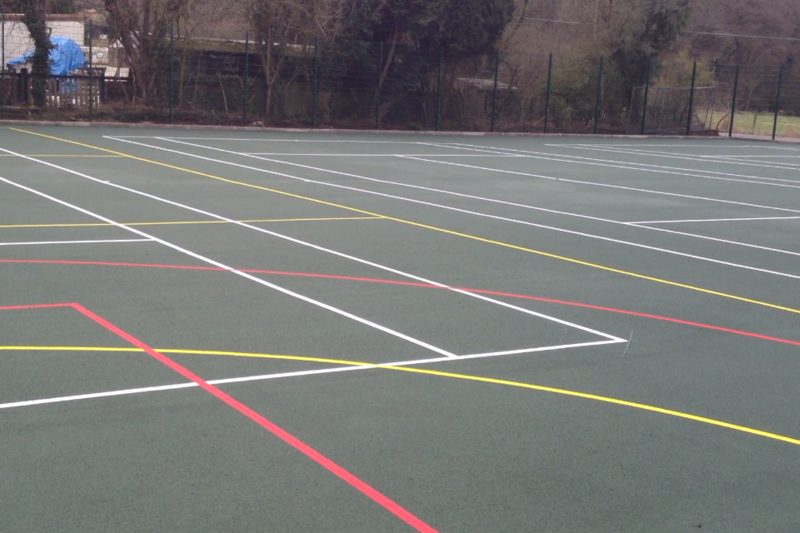 One of the services we provide is full sports court installation in a range of bright colours with contrasting polymeric line marking. 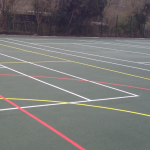 These markings can be applied in anti slip paint for a single sport or for a number of different sports if you are looking to install a multi use games area. 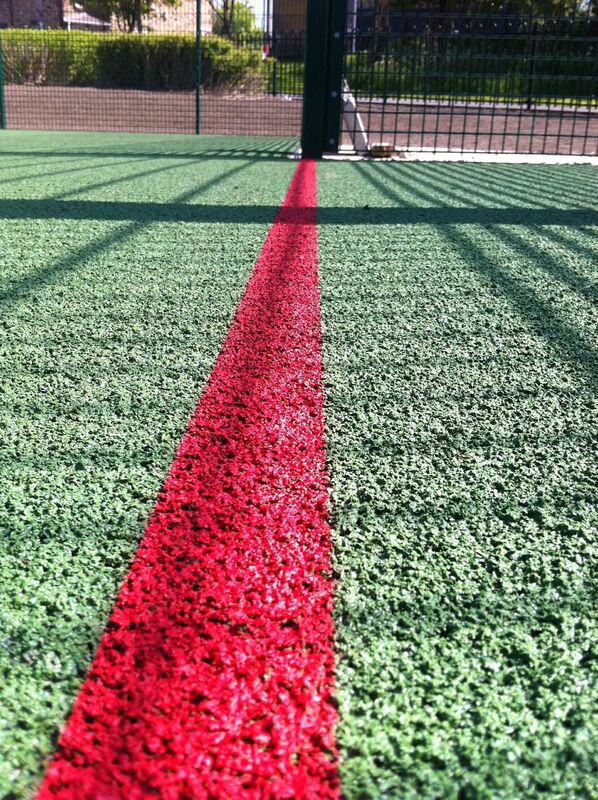 We can add contrasting coloured lines for a range of activities, meaning the facility is much more diverse and efficient. The non slip qualities of the paint and markings help to increase traction on the court, making better game play for sports like netball. This also helps to keep players safe as it prevents them from slipping over and getting injured, particularly in wet conditions. If you are interested in having a polymeric surface construction project carried out at your organisation, we would be happy to help with this. Our team can complete the whole process including groundworks, laying the rubber surfacing, painting, line marking and adding extra features. All of this depends on the type of design you would like and what your primary activities will be, but we can customise the work to suit you. The costs for different polymeric services will of course vary for each project depending on the specification and scope of works. A number of other factors including area size, project location and site access also have an effect on the overall price for the works. 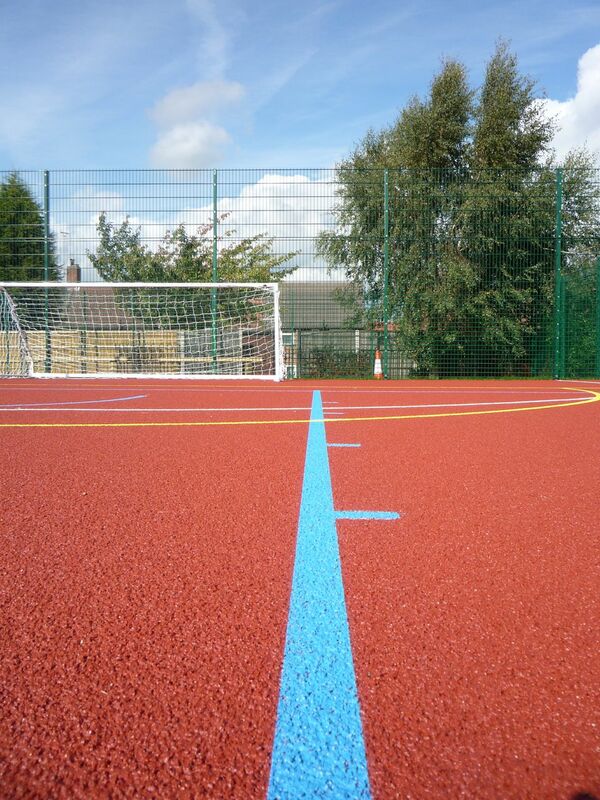 Costs for polymeric services for sports courts and athletics tracks can be managed through a range of options including surfacing specification and any extra equipment you choose to install such as fencing and floodlighting. Managing these variables can help keep costs for the overall project within your budget while still providing you with a top quality sports facility. This is a video showing the installation of a polymeric multi use games area surface. Our team of installers carried out the full construction including groundworks, sub base and surface application. Once the rubber flooring was in place, we applied an anti slip paint coating in blue, with yellow and red line markings for the different activities that the court will be used for. 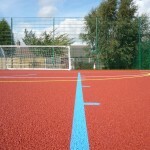 The primary sports included basketball and netball, and this surface is ideal for playing both of these. The clients also chose to have rebound fencing fitted around the perimeter of the area to keep their facility secure. Another of the services we can offer is polymeric maintenance and deep cleaning to help keep your sports facility in top condition after the installation process has been completed. The simplest type of maintenance for a rubber sports surface includes regularly brushing and clearing the area of dirt and debris which will help to maintain good water drainage and prevent flooding. Other types of polymeric services and maintenance include damage repairs, repainting and reline marking, chemical moss and algae treatments and even total resurfacing if the facility is in a very bad condition. Prices for maintenance of an EPDM rubber sport surface will also vary depending on area size, surface specification and access to site, however keeping your facility well maintained is a good investment as it can cut future costs for your organisation. You can also have sport surface testing carried out to help determine the most appropriate cleaning and maintenance schedule based on ball bounce capabilities, slip resistance and drainage qualities. Making sure that you keep your polymeric court or athletics track well looked after with regular maintenance will help protect the flooring from damage and therefore reduce the need for repairs and resurfacing in the future. 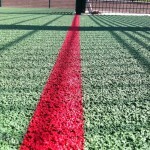 We aim to offer you great value polymeric services for your sports facility to ensure that it is safe for players and provides the best possible playing characteristics. As specialists in the installation of a variety of outdoor sport facilities in the UK, we will offer product sheets and quotes for any polymeric services you may need. Our polymeric surfacing contractors have worked on many projects and would be happy to assist with any questions you might have. Feel free to ask if you would like some information sheets on everything we offer, or if you’d like to see a case study of our previous work. You can get in touch with us through our contact form if you want to discuss an enquiry or the costs for a particular product. Just fill it in with some details about what you need including a location and area size if you are looking to have a facility built or painted. 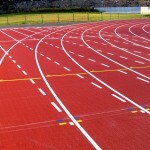 1 What is Polymeric Sports Flooring?